More Sunday Independent cartoons from the Dublin Lockout. | Come Here To Me! More Sunday Independent cartoons from the Dublin Lockout. A recent post looking at some cartoons printed in the Sunday Independent during the Lockout proved popular, and in reality the cartoons we selected were only a small percentage of those that appeared in the publication. Cartoons were a form of propaganda used by both sides in the dispute, and these cartoons always ran on the front page of the newspaper. All the cartoons I have chosen for this post come from 1914, as the dispute dragged into that year before ending in failure for Larkin’s movement. The cartoons are the work of Frank Rigney, cartoonist with the Sunday Independent. 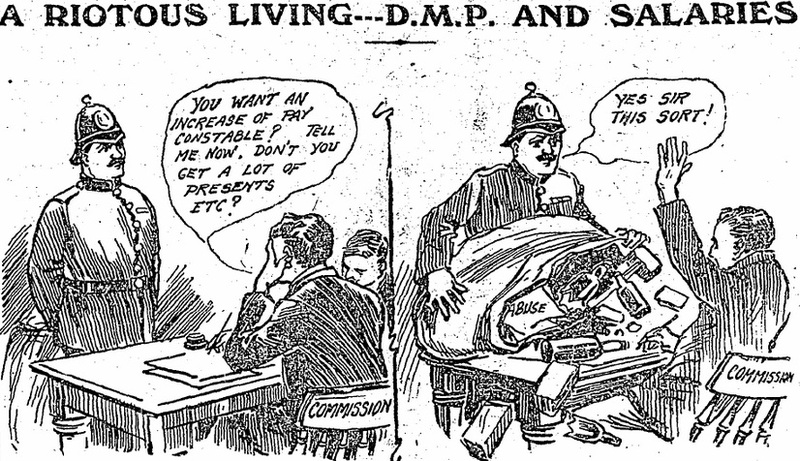 This cartoon from the month of February focused on the issue of pay for DMP men. The role of the DMP in the dispute, and in particular the events of Bloody Sunday in August 1913, ensured that their place in Dublin folk memory would not be as a revered force. The paper staunchly defended the actions of Dublin policemen during the months of strife. 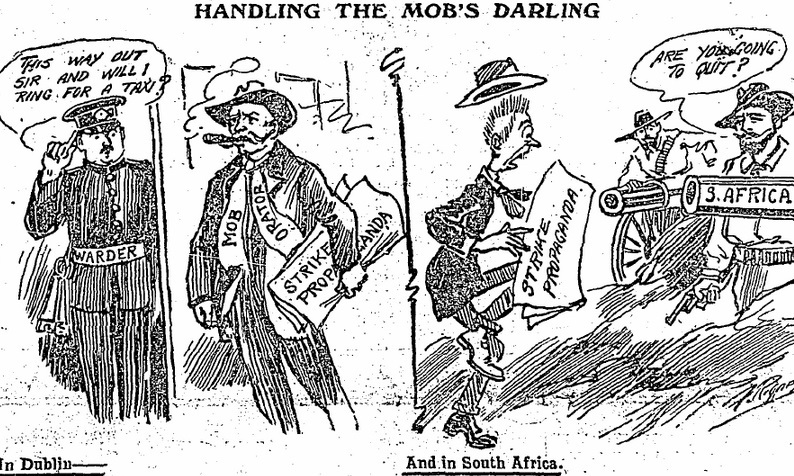 In the same edition of the paper, this cartoon appeared, which called for a tough approach to be taken against the mob’s darling. This sinister cartoon draws parallels with the labour situation in South Africa, where military force had been used against the union movement there. A contemporary newspaper report on events in South Africa can be read here. The paper routinely attacked Larkin and other ITGWU leadership figures as leading dupes into battle. 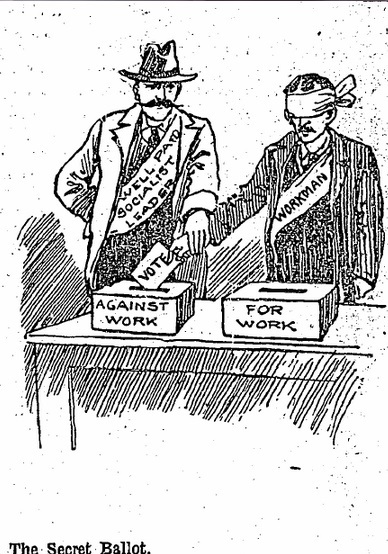 A cartoon posted in the last series we ran here showed a worker awakening from the nightmare of socialism, while here the ‘Wellvpaid Socialist Leader’ is seen directing the vote of a blindfolded worker. The theme of workers realising the error of their way and returning to work was commonplace in the paper. 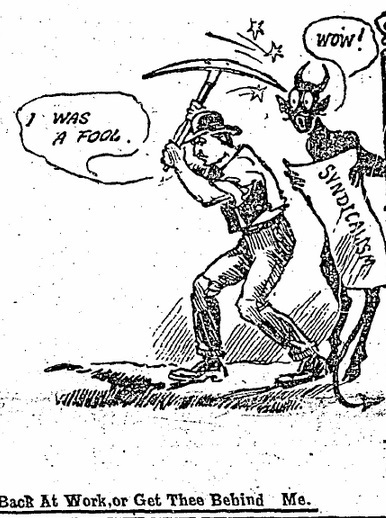 This cartoon shows a rather sinister looking fella, Syndicalism, looking on in astonishment at a Dublin worrker who has returned to work! The paper also looked at Irish nationalist questions in its cartoons. It should be remembered that William Martin Murphy, owner of the publication and several others, was a vocal Home Rule campaigner, and this was reflected in the cartoons of the paper even during the dispute. 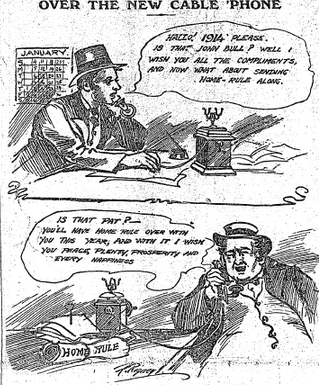 This cartoon showed John Bull and Pat in discussion, noting that 1914 would be the year when Home Rule became a reality for Ireland. The slaughter of WWI would kill that plan of course, and lead to a split in Irish nationalism. We will definitely return to these cartoons as a post of their own in the near future. Amusing cartoons from the Sunday Independent!! on August 29, 2013 at 10:04 am | Reply More Sunday Independent cartoons from during the 1913 Lockout. | Come here to me!